Was Philip martyred at Hierapolis/Pamukkale? Hierapolis is the most popular archaelogical site in Turkey, with its peak of 2 million tourists in 2014 and a comparable number anticipated for 2018. 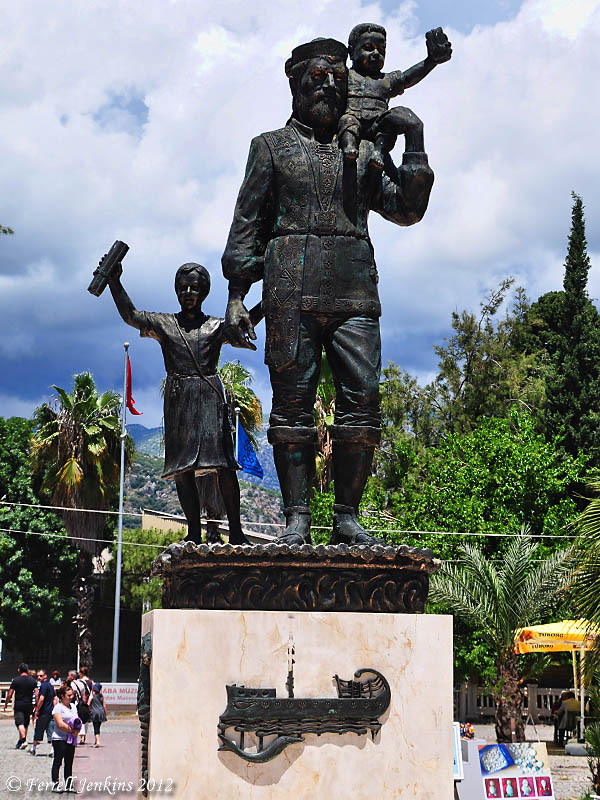 In fact, most of them — largely Russians on day trips from Antalya — see only the natural features of the place: the white cascades of travertine created by thermal waters flowing downhill. 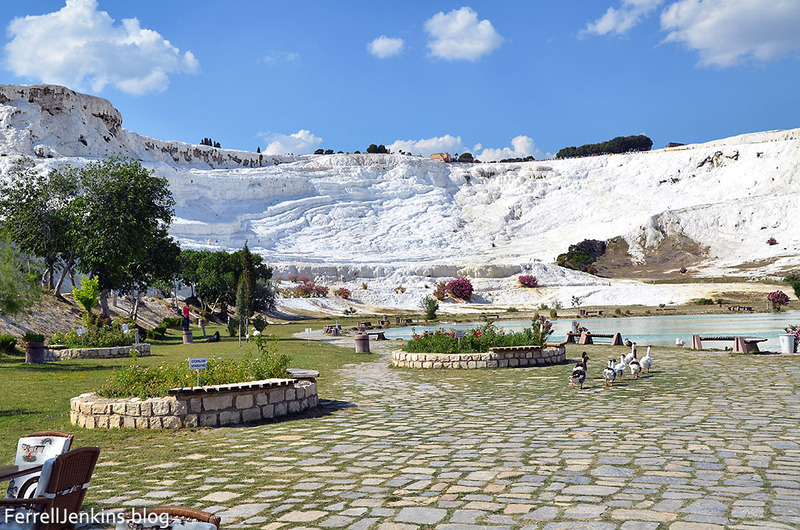 The venue is better known in Turkish as Pamukkale, literally the “cotton castle,” whose light blue natural pools are featured in every tourism brochure. Mancini discusses the archaeological work done by Italian scholars. In 2011 they were convinced that they had located the tomb of Philip the Apostle (Matthew 10:3). 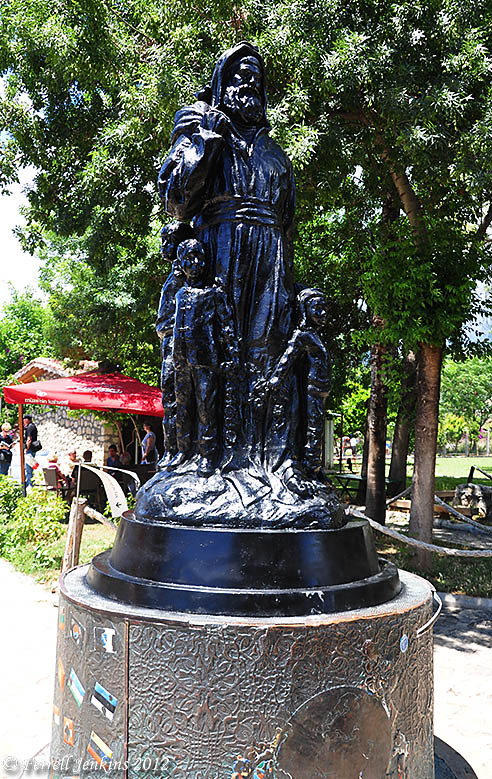 He laments that most of the tourists visit only a limited area of Pamukkale. Few tourists walk the paved roads among the ruins or sit in the well-preserved theater. 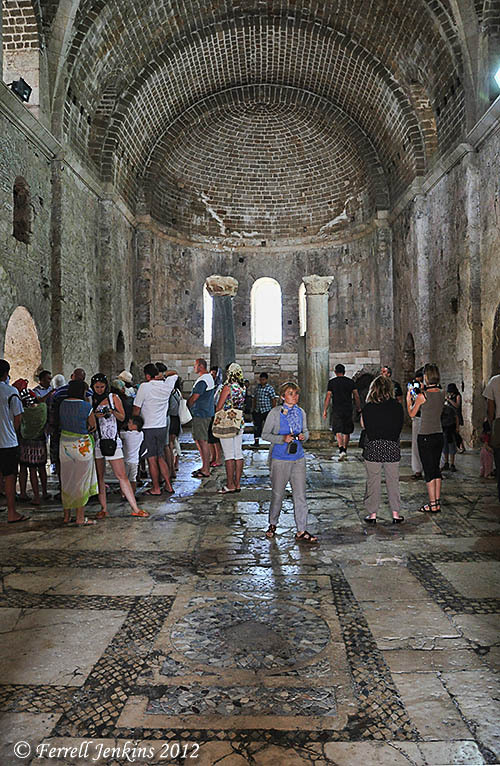 Fewer still are adventurous enough to climb the steep hill overlooking Pamukkale and Hierapolis — guides apparently advise against going there — where the Christian St. Philip the Apostle was killed, buried and venerated for many centuries. I have observed the same thing and understand the reasons. 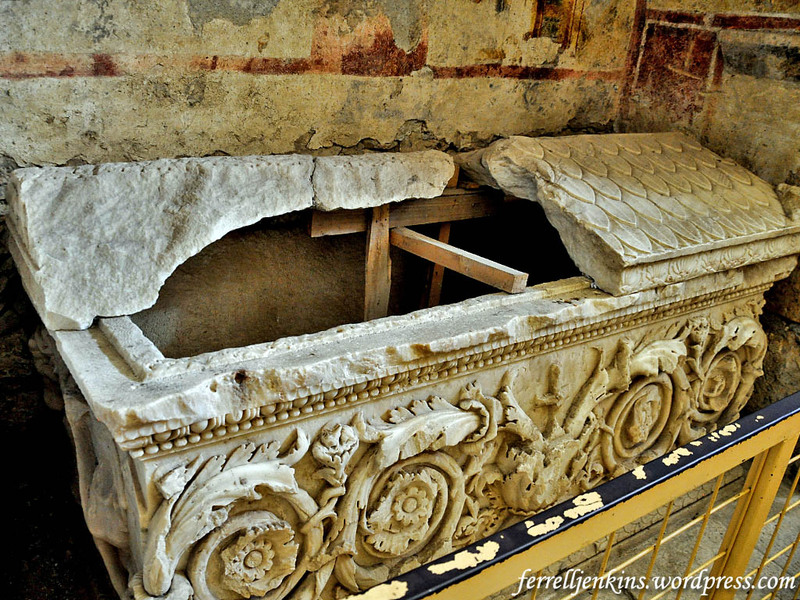 (1) The tomb of Philip is an archaeological site. (2) It is a relatively long distance from the cascades, pools, and shops. (3) Tour groups are limited in time and (4) the greater number of tour members would not take time to visit a site like this. Let me show you. You will be able to see the buildings dedicated to Philip right of the center of the photo on the top of the hill. First you get to walk on ruins of an ancient road. After walking a rather long distance to the approach to the Martyrium of Philip, we pass through the Byzantine walls of Hierapolis. Photo by Ferrell Jenkins. But that is not all. Next you must climb these steps to a plateau near the tomb and complex of buildings. Tradition associates these steps with the Martyrium of Philip the Apostle. Photo by Ferrell Jenkins. 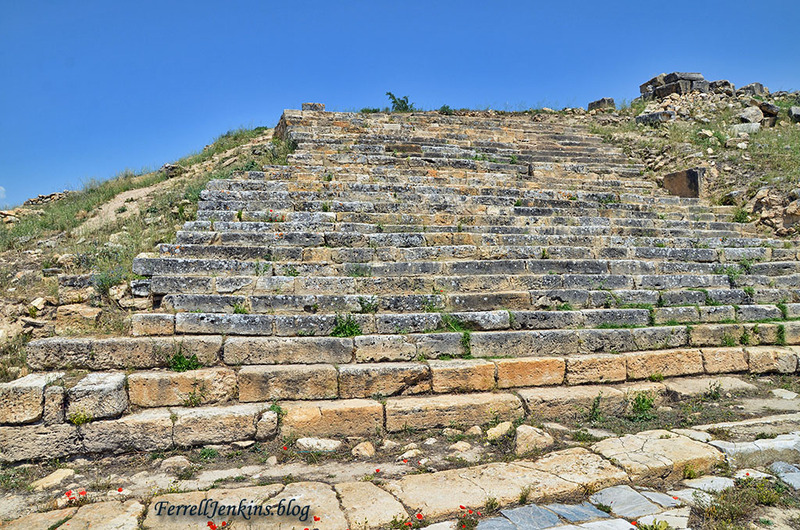 When you think you have almost arrived, you see steep steps that must be climbed to the plateau where the Martyrium is located. The final steps leading to the Martyrium of Philip. Photo by Ferrell Jenkins. Then you come to the ruins of the church where pilgrims came to honor Philip. Pilgrims came to this building to honor Philip. Photo by Ferrell Jenkins. There is another building of significance at the site. It is an octagonal building said to have been where Philip was martyred. Only the strongest portions of the building stand. The Martyrium of Philip was constructed in the early 5th century A.D. on the site thought to be where Philip was martyred. Photo by Ferrell Jenkins. 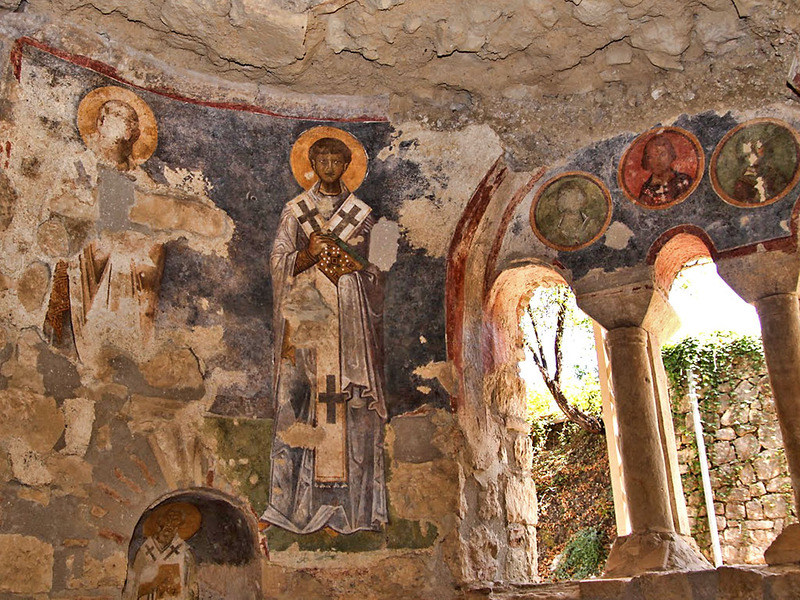 The martyrium was apparently used neither as a church (no altar has been found) nor as a burial site (no tomb has been found) but rather served as a place for processions and special services in honor of the saint. (A Guide to Biblical Sites in Greece and Turkey, p. 215). According to Fatih Cimok these building were destroyed by fire in the 6th century and never rebuilt (Biblical Anatolia, p 160). 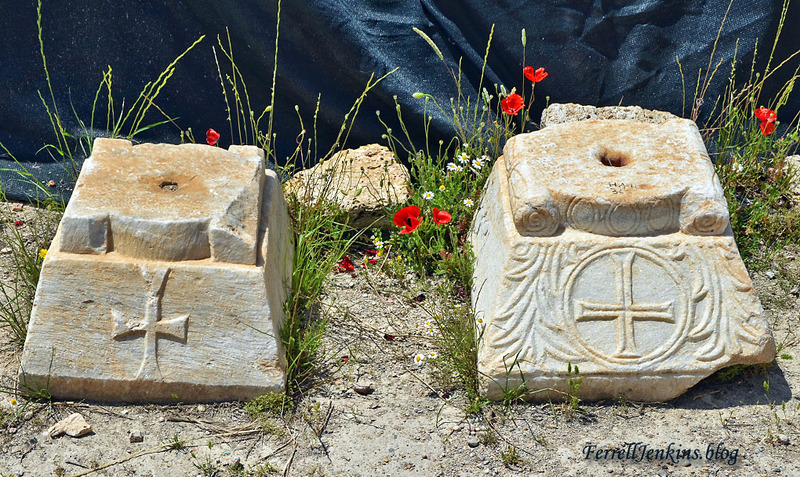 Crosses on column bases in the Martyrium of Philip at Hierapolis. Photo by Ferrell Jenkins. 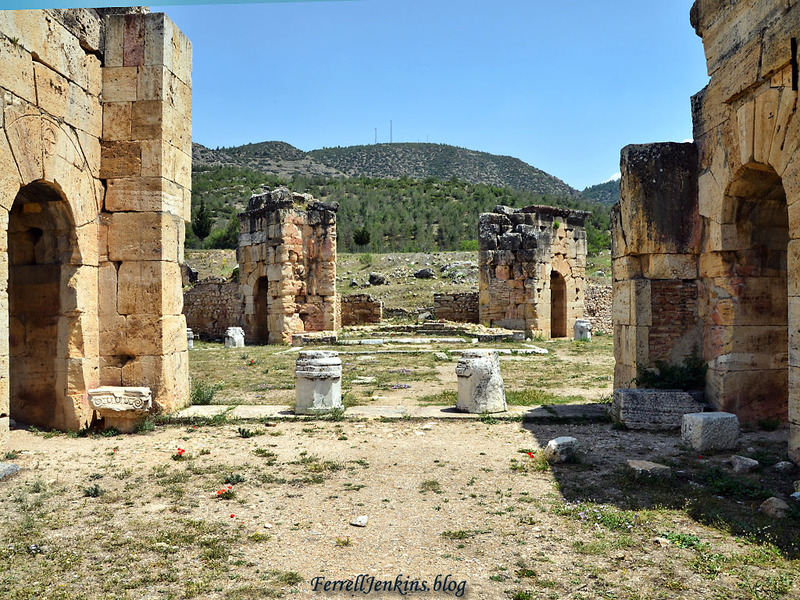 There is much more to see at Hierapolis, including a small but nice museum. Perhaps at a later time I will show you the Hellenistic Theater, the street and arch dedicated to Emperor Domitian, and some of the elaborate tombs. In fact, some have been discussed before. 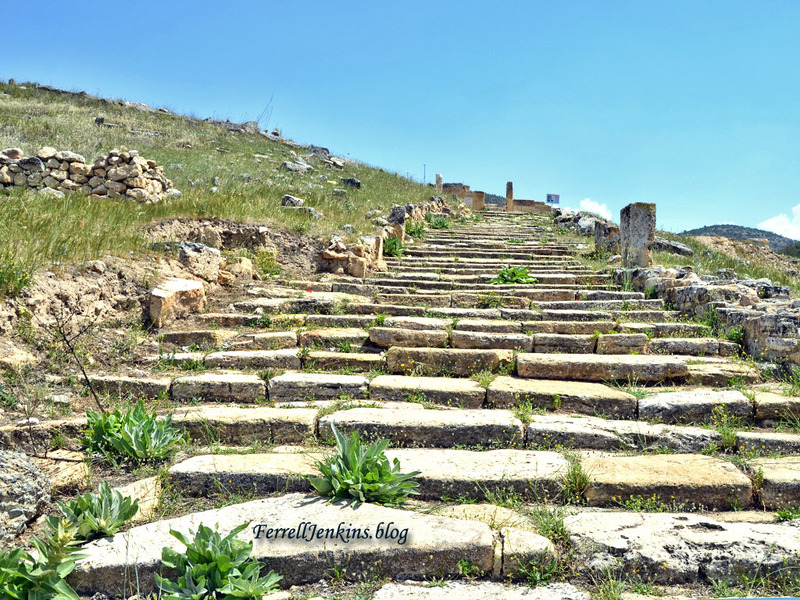 You may locate the posts by typing Hierapolis or Pamukkale in the Search Box. Resources: In addition to sources cited here, I cited Mark Wilson’s Biblical Turkey in the previous post. These are wonderful resources to use in preparation for a trip to Turkey. 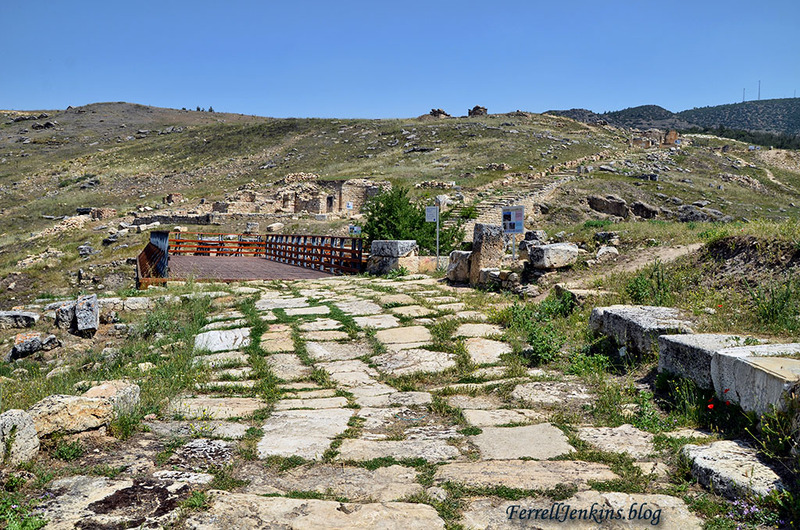 The city of Hierapolis (“holy city”) is one of the three cities of the Lycus River valley named in the New Testament. For I bear him witness that he has worked hard for you and for those in Laodicea and in Hierapolis. (Colossians 4:13 ESV). 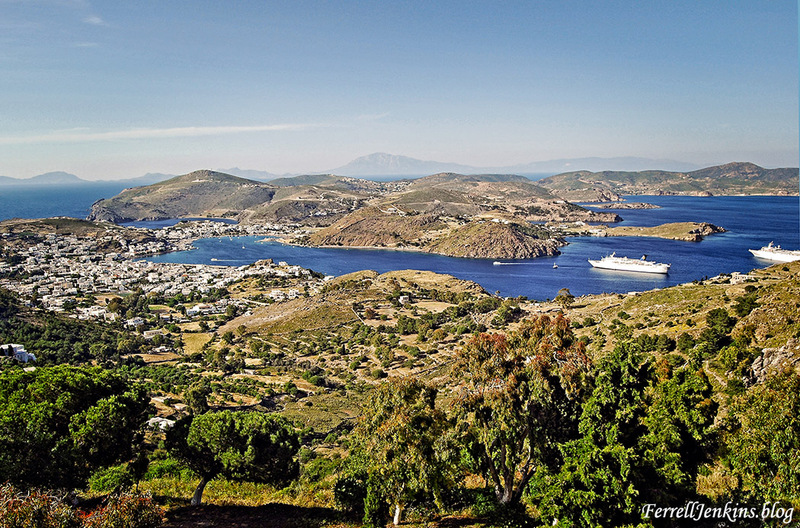 … is famous for its continuing geological transformation. Hot mineral springs issue from the rock in the city, and the waters streaming down the cliffs have deposited limestone in large formations, the surface of which is made a gleaming white ‘frozen cascades’ (IDB II:601). A view of the limestone cascade that has formed as a result of the warm water running over the hillside. The spring water at the source is a constant 30º celsus (95º for the rest of us). Click the photo for a larger image. Photo by Ferrell Jenkins. 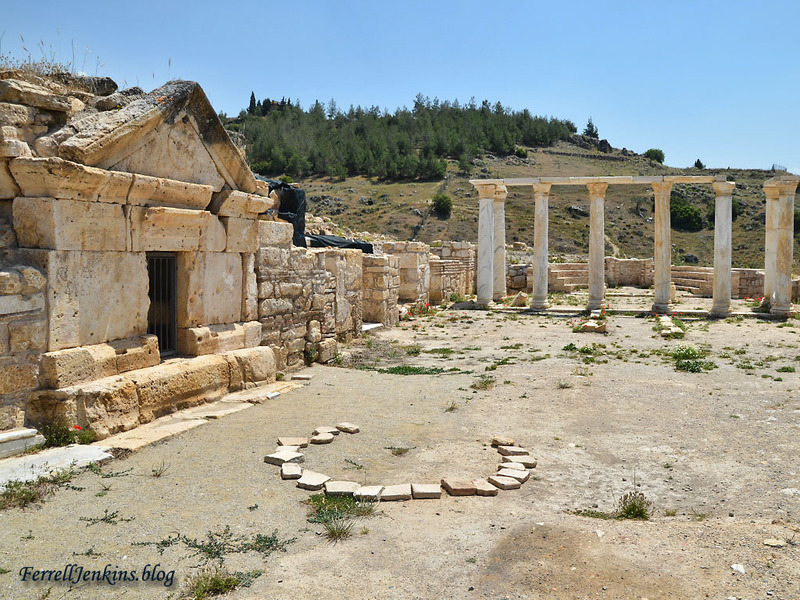 Hierapolis was the home of Papias (c. A.D. 60 to c. A.D. 130), a disciple of the apostle John and a companion of Polycarp. Some traditions associate Philip with the city. 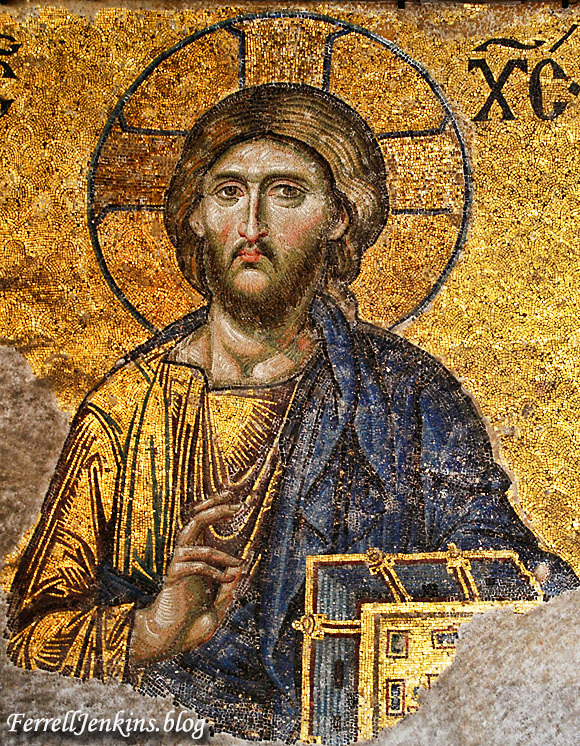 All of the information at the site identify this as Philip, one of the apostles of Jesus (Matthew 10:3). Some scholars suggest the association was with Philip the evangelist (Acts 6:5; 8:5; 21:8). Wilson briefly sorts through the confusion and concludes the better evidence indicates the apostle Philip (Biblical Turkey, 245). In the 5th century A.D. a monument called the Martyrium of Philip was built to remember the disciple of the Lord from Palestine. In the next post we will show some photographs of the ruins of the monument. The ancient city of Pergamum, at Bergama, Turkey, was the location of one of the churches addressed in the book of Revelation (the Apocalypse). Like the other six local churches mentioned in the book, a short letter is addressed to Pergamum (Revelation 1:11; 2:12-17). I thought I would share a beautiful spring photo made among the ruins of the city. Reconstructed temple of Emperor Trajan in Pergamum. Photo by Ferrell Jenkins. This photo shows the reconstruction of the Temple of Roman Emperor Trajan (A.D. 98-117). This was the second temple in Pergamum dedicated to the Emperor. The first temple in all of Asia was erected to Augustus in 29 B.C. 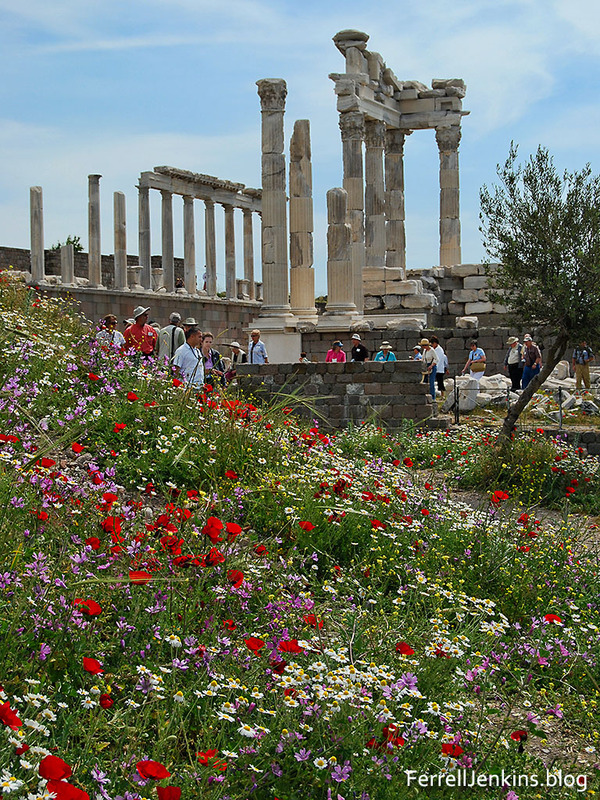 Altogether Pergamum had three imperial temples. Emperor worship was common throughout the Roman Empire, but especially in the eastern part of the Empire. In the centuries following New Testament times this would create a problem for those who were devoted to Jesus Christ as Lord and God. Word comes this morning about the death of renowned evangelist Billy Graham at the age of 99. During the years when I actively participated in the annual professional meetings of the Evangelical Theological Society and the Society of Biblical Literature I was frequently asked if Florida College, Temple Terrace, FL, where I taught, was where Billy Graham went to college. The answer was “Yes” and “No.” Graham attended Florida Bible Institute which was founded in 1940. The campus was already a historic location. In the pre-Depression years it had been the home of a well-known resort, including a hotel associated with the Palmer family of Chicago, and a beautiful golf course. I don’t know why, but Florida Bible Institute soon moved to New Port Richey, FL, and became known as Trinity College of Florida. For a few years the property in Temple Terrace was unoccupied. During the War years the buildings were used to house soldiers from a nearby air base (where Busch Garden, Tampa, is now located). Florida Christian College (now Florida College) was founded as a private liberal arts college in 1946 on the same campus. 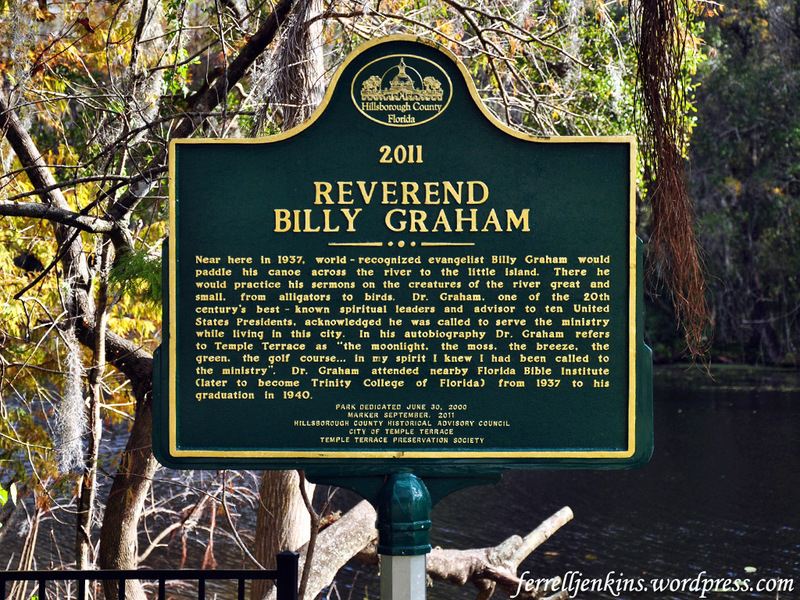 A few years ago several agencies interested in claiming an association with Billy Graham dedicated a little park on the banks of the Hillsborough River a few steps from Florida College in Temple Terrace. I thought some readers would enjoy seeing these photographs of the park. The marker is in the center of the photo. 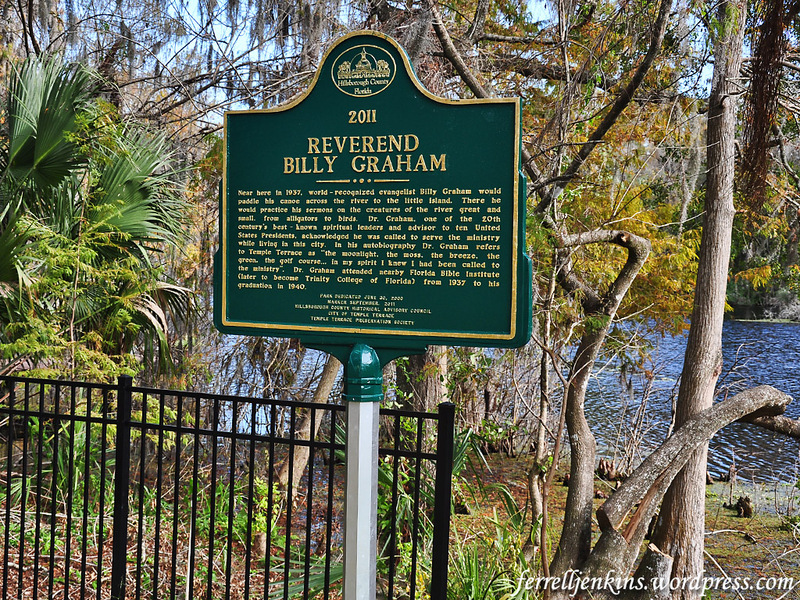 Billy Graham Historical Marker in a small park on the Hillsborough River, Temple Terrace, FL. Photo by Ferrell Jenkins. 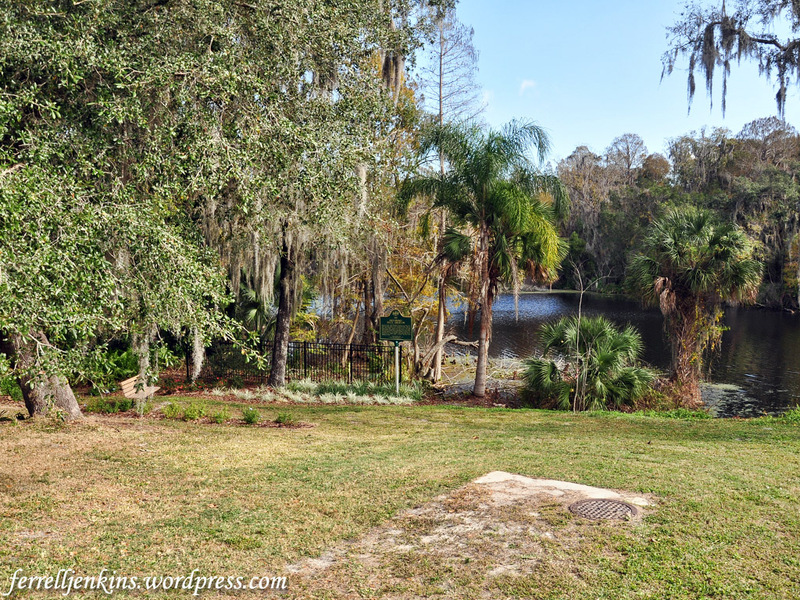 Our next photo shows the marker and the Hillsborough River where, or near where, Graham is said to have practiced his early sermons. The Graham historical marker on the banks of the Hillsborough River. Photo by Ferrell Jenkins. For those who wish to read the marker I have included this close up. You may click on the photo for a larger image. Billy Graham Historical marker in Temple Terrace, F. Photo by Ferrell Jenkins. Even if one does not agree with Graham’s religious views, he/she must acknowledge the role he played in American religious life over the past four score years.